A film that doesn’t necessarily bring anything new or original to the saturated comedy genre, but is good value nonetheless. 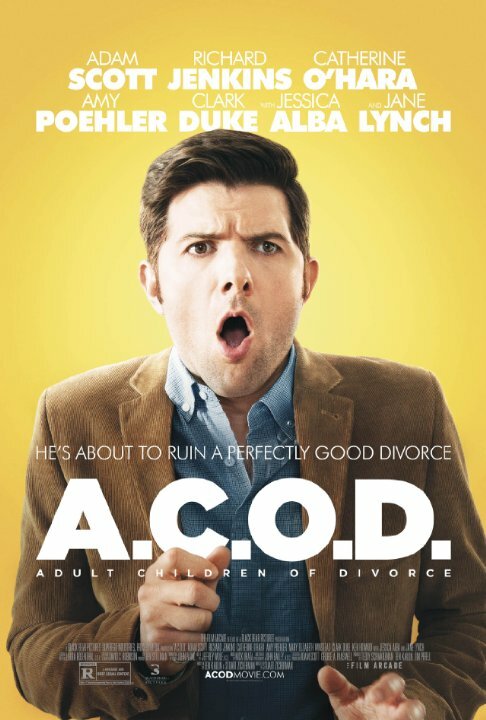 A.C.O.D stars Adam Scott as Carter, the child of divorced parents Hugh (Jenkins) and Melissa (O’Hara). Now grown up and seemingly living his own life, he is tasked by his younger brother Trey (Duke) to bring them back together for his wedding. Hugh and Melissa are both remarried and completely hate each others guts, unable to be in the same room as each other. Carter seeks the help of his therapist as a kid, Dr. Judith (Lynch), to bring them back together. However, he soon discovers that what he thought was therapy was actually a study by Judith into children of divorce, and she seeks Carters help into a follow-up study, ‘Adult Children of Divorce’. While unwillingly on the study, Carter starts to uncover some of his own insecurities, including his lack of commitment to girlfriend of five years Lauren (Winstead). For a comedy this isn’t really funny. There’s very few actual jokes in the film, and most of the laughs come from the general situation and characters. This is more light-entertainment than flat our comedy. However the story itself is quite a good one, looking at how divorce can affect the child. The main character Carter is quite an interesting and likeable character, very down to earth but obviously unaware of his own problems. In general all the characters in this film are likeable, even the battling parents, because you understand what everyone is going through and why they’re doing what they’re doing. A.C.O.D is very character-led, and all the characters are very easy going and easily understood – just like the film itself. Filmed in Atlanta, the setting for this film is very classy and attractive, and also makes me instantly want to move there! I was seriously impressed by Adam Scott in A.C.O.D. He leads the film with charisma and intelligence, and also a sense of naivety that isn’t always easy to pull off. All the actors are light hearted in this which adds to the general lightness of the movie, but doesn’t necessarily lead to exceptional performances. Everyone else is kind of exactly how you would expect them to be before watching the movie. The directing in this film is okay. There’s nothing done by Stu Zicherman that is completely memorable, but there is some good looking scenes in this film, helped by the beautiful locations themselves! This is funny, but if it’s flat out laughs you’re after then there is plenty of funnier films out there than this one. However the beautiful setting, the lovable lead and a genuinely interesting story make this definitely worth a watch.